Last season, Washington Capitals center Evgeny Kuznetsov was walking around Capital One Arena when he noticed the door to the visitors' locker room was not only left ajar, but unattended. Curious, Kuznetsov poked his head inside. He noticed a fridge in the corner that was stocked with bottles of something he had never seen before. "It is bad," he admits, then flashes a sinister smile. "But I took one." As Kuznetsov slipped out of forbidden territory onto safe ground, he opened up his stolen treasure and took a sip. "It was delicious," he said. "I wanted to know what it was." It was a bottle of coconut water -- but not with the chalky, milky consistency that tends to turn off first-time sippers. This kind was tinted with flavor (Kuznetsov believes it was orange) and tasted like a sweet juice. He went online to learn more and found out he could try passion fruit, pineapple or lemon. He ordered a case and had it sent to his house in Virginia. When he ran out, he had another sent. And then another. "There are so many flavors, and it just tastes good," Kuznetsov says. "So I drink it instead of ... I don't know, beer." Unknowingly, Kuznetsov had joined a major athletic trend. Droves of athletes across all sports -- especially hockey -- have turned onto coconut water as a go-to form for hydration. Although Gatorade is synonymous with professional sports (the iconic green bottles line every NHL bench, as the company is a league sponsor), many athletes who are conscious about what they put into their body are becoming wary of its sugar content (34 grams per 16.9-ounce bottle) as well as the artificial dyes. Coconut water offers the same benefits and electrolytes, but it can be sold at Whole Foods. "I am very careful with my health as I get older to stay in the league," says journeyman winger Jussi Jokinen, 35, who has bounced among seven teams in the past six years. "We sweat so much, and we lose a lot. I want things that are natural, and so I tried coconut water a few years ago because it is more natural than Gatorade." Coconut water is not the only Gatorade replacement; the Canadian company BioSteel has also made waves in the NHL market. The all-natural sports drink mix looks a lot like Gatorade -- and tastes similar -- and has crept its way into locker rooms, as well. Several NHL players, led by Connor McDavid, are company ambassadors and get shipments throughout the year. Though there are several coconut water companies that cater directly to athletes, by far the most popular is COCO5, headquartered in Chicago. Its roots are as organic as the product. In 2009, Scott Sandler, a local entrepreneur, was talking to Chicago Blackhawks trainer Mike Gapski about sports drink alternatives that might have less dye. That sparked Sandler to explore coconut water, though he knew the taste was a common deterrent. Sandler enlisted a food scientist to work on a new formula that would making it more palatable without adding any preservatives -- or too much potassium or sodium, which halt absorption -- therefore maintaining the integrity of the drink. "This guy has won awards for making bacon-flavored vodka," says Sandler, now the company's CEO. "He told me, 'I can make anything taste good.'" The rest is (very lucrative) history. "About three or four years ago, they started putting it in the fridges in our locker room," Anaheim Ducks defenseman Cam Fowler says. "I knew there were a lot of benefits to it, I like the taste to it, so I started drinking it more. Gatorade is mainly for the games for me. It's on the bench, and it's good when you're sweating a lot, but I know it's a lot of sugar, so I try to stay away from it when I can." 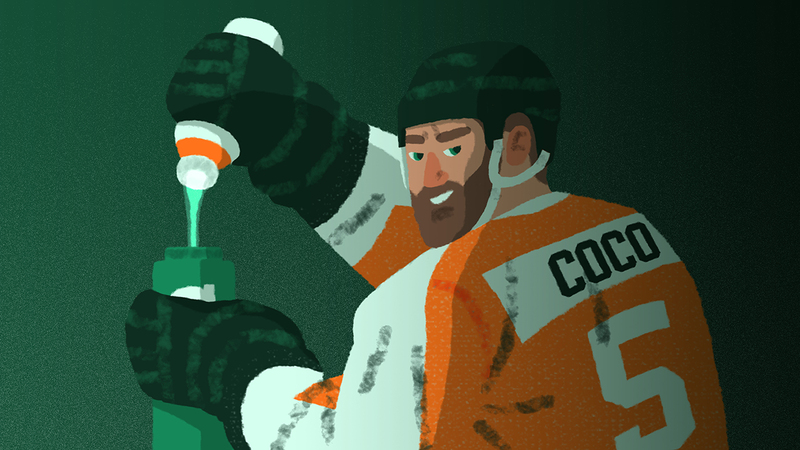 COCO5 can be found in at least 26 locker rooms in the NHL, as well as 86 across professional or collegiate sports. About half of MLB teams are buyers, as well as several in the NBA. In fact, NBA player Marcus Morris is an investor. "He reached out to me," Sandler says, explaining that he received a cold call from Morris about two years ago. The Detroit Pistons were in town to play the Chicago Bulls, and Morris set up a lunch. Sandler apologized; he explained his was a young company and they couldn't offer endorsements. But Morris said he wanted to open up his checkbook instead. That's a big change from the company's inauspicious start. COCO5 hasn't made much of a dent in football, but that's likely the next frontier. Most of the company's initial marketing was word of mouth. Its headquarters are inconspicuous -- a warehouse in an industrial swath of Chicago's West Loop. Since the Blackhawks were early adopters, the biggest boon came from their post-championship salary jam, as general manager Stan Bowman began making a flurry of trades starting in 2010. "They trade seven players to five new teams," Sandler says. "And all of the sudden, we have five new teams as customers." When NHL players were sent down to AHL affiliates, Sandler found the minor league trainers calling him for shipments. There's also team-to-team marketing. In 2013, the Ducks felt good after going up 3-2 on the Detroit Red Wings in the first round, so they put in an express order for 60 cases to be delivered to Detroit. But when Detroit won back-to-back games to clinch the series, Ducks trainers didn't know what to do with the remaining 30 cases. The Red Wings trainers offered to buy them, but the Ducks gave them as a gift. A year later, the Red Wings became clients. "Guys try to pick up on these things all the time," Los Angeles Kings defenseman Drew Doughty says. "And then they become fads. This might just be a fad. Gatorade has always been around, so I just drink that." Locker rooms are littered with different products; the Canadian-based supplement BioSteel is prevalent in the NHL. As I was reporting on this story, one player who skated in the 2018 Stanley Cup Final encouraged me to write about Pedialyte, which is mostly marketed for children with, uh, bowel problems. "That's what we're all using when we're hungover," the player said. "Coconut water -- it's available to us," New York Islanders winger Anders Lee says. "It was really big a couple years ago. I've tried it, and I know there's great stuff in it; I just don't like coconuts." "You see guys with all sorts of drinks," teammate Josh Bailey says. "BioSteel has become popular also. So maybe Gatorade is phasing out a bit." Talking about anything but Gatorade can feel taboo, since it's ingrained in hockey; PepsiCo has been the NHL's sponsor since 2006 and also has exclusive deals with about half of the league's teams. The companies re-upped their partnership for another five years in January. Not only do you see the squeezable bottles in Gatorade-logo green on the bench, but on top of the goalie's nets, as well; let's just say they get prominent TV airtime. Rumors swirl that some players were pouring coconut water into those bottles during games -- and not water -- though most players I interviewed denied that specific accusation. One player told me he rips off coconut water labels because although he loves the product, he doesn't want to be photographed with it because it is not Gatorade. Coconut water consumption among athletes predates 2009, beginning with Vegas Golden Knights goaltender Malcolm Subban, who says, "I've been drinking coconut water forever. I'm Jamaican." Capitals defenseman Brooks Orpik drinks coconut water "just about every day" he skates. Orpik became an adopter in 2008 by the advice of Gary Roberts, who joined Orpik with the Pittsburgh Penguins at the trade deadline. "When Gary came in, he was pretty appalled by our team diet -- what they served us on the plane or in the arena," Orpik says. "It was funny, because usually when a new guy comes, he tries to blend in, and Gary came in, and right from Day 1 with a big voice. At first I was like, this guy is out of his mind. It was such a drastic change, and he didn't ease us into it -- one extreme to another. Guys listened to him because of what he had done in his career." So began a series of edicts, including no more sugar on the plane, unless it was coming from natural sources, such as fruit. Within days, coconut water replaced soda as an offering. "Looking back, there were a lot of good draft picks to that organization, but Gary brought a lot of professionalism," says Orpik, who is now renowned for healthy habits. And for a new generation, coconut water is all they know. "I've always seen it in locker rooms," says 24-year-old Calgary Flames center Mark Jankowski. "I like it. I don't mind the taste. When I first started tasting, I was like, 'Ehh.' It grows on you. During games, I stick with water; I don't drink anything but water during games. But after the game, I'll drink it." The addiction to COCO5 is palpable. For the 2014 Olympics, the company got the OK from the U.S. national team to send cases to Sochi, per the players' request. Only one problem: The product, along with cases of Chobani yogurt, ended up on the wrong plane. Johnny Oduya to the rescue. The then-Blackhawks defenseman was competing for Team Sweden and hadn't left for Sochi yet; he brought over the goods for his American friends. The New York Yankees are another big buyer -- and are quite superstitious, it seems. A few years ago, they were on a long road trip and a trainer called Sandler in a panic: "Can you overnight 25 cases of the pineapple flavor?" Sandler paused: "Do you have any idea the cost? They're 15 pounds. It's going to cost $1,000 in shipping to you overnight." The trainer wasn't deterred. The Yankees were heading into a double-digit win streak. They couldn't change routine. And then the trainer called back: "You have to make it 30 cases. I looked back at our last five orders, and that's what we put in."